Help me Cranky Kong, you're my only hope. 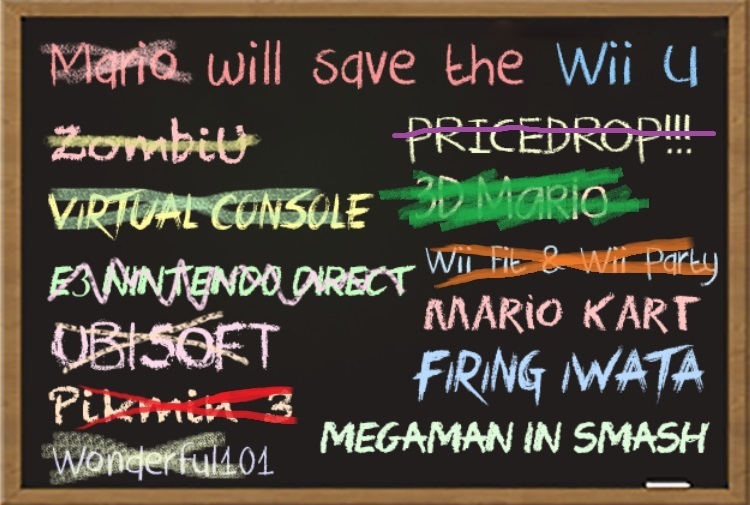 Poor WiiU. Vita might live afterall. Utakumi 575 bombing makes me sad. The game is a TON of fun and has some really unique new features for a rhythm game. Dang, Saints Row IV up there. Erm, when is the next big 3DS release/thing? That is a concerning number. Seeing Saints Row in the top 4 feels bizarre. Saints Row IV selling better than Dragon Ball on PS3. Is this the first time the PS3 outsells the OG 3DS? Pretty horrible HW sales overall. Is there any decent releases coming soon? If not we may see some shockingly low numbers overall (though i guess PS4 is soon). Vita is life. I wonder if 3DS sales fall so much that the Vita takes the first place. Does the Vita 2000 come packed with heroin or something? All of a sudden it has more stable sales than the 3DS. Not great for Sengoku Basara 4 at all. It's not terrible, but it's definitely a substantial decline from SB3. It opened higher than the first two games, but it might or might not have the legs of SB2. Looks like another franchise decline for Capcom. Uta Kumi 575 is no Miku. Whatever Sony did to achieve this is worth nothing but praise. It reached its peak last year. Iwata taking a pay cut needs to be up there. It has already sold 15m. A decline is to be expected. It's no DS but even DS experienced its own relative decline at this point in its life. 2012/2013 years are not sustainable numbers for any system, even the DS. Guess Uta Kumi 575 bombed? Thought stufflike that sells better in Japan. Also, Dragon Ball Z shows once again that publishers can get nice additional sales from a PS3/Vita multiplatform title. Maybe Capcom should have considered something like that. They probably could've got an extra 100k out of that, yeah. All down from last year except Vita. This is what I find funny when people keep saying it's dying or dead. I wonder what the reason for it is? General franchise fatigue and decline? Capcom took too long after SB3 and the heat on the series cooled? Maybe Japan is more ready to move on from the PS3 than was previously thought, in which case that might be a worry for late gen releases like Persona 5? While the overall sales are pretty horrible. I am quite surprised at the sales number across both platforms. Needless to say, every PS3 game should get a VITA port from now on. The numbers are pretty decent and i doubt it will cost much to port these games to VITA. WiiU continues to drop like a stone. I do wonder at what point Nintendo will pull the plug. I'm loving the Vita uptick. Great quality being recognized. Another Sengoku Basara game, another sizable discrepancy between trackers. 87k between all the systems. Depressing. Compared to the PSP it is doing terrible. This is nothing new. 20k is okay for a dead/dying system but it's still terrible for a handheld in japan. Well, there goes that new franchise. Poor SEGA. Vita hardware holding up well, retail software sales continue to be dire though. Maybe jp gamer are expecting huge price cut for wii u? I'm pretty sure it's time for a new 3DS revision. I wouldn't be surprised if the 2DS hits soon. But it's not dead and it's not dying.